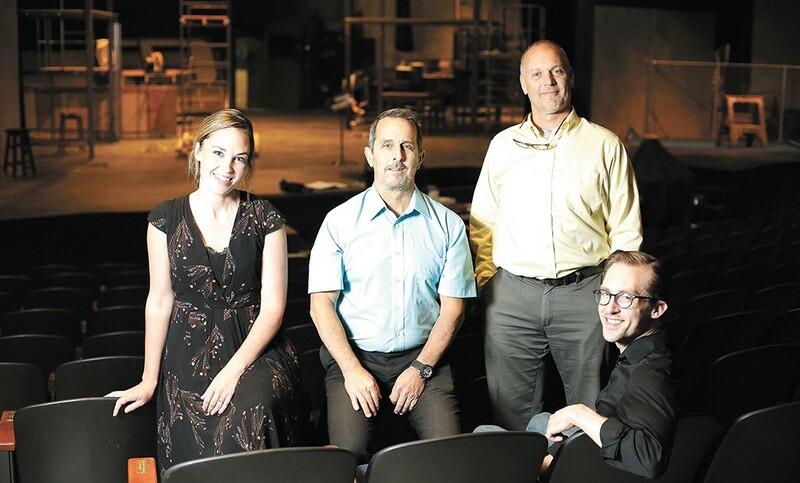 FROM LEFT: The Civic's Marketing Coordinator Emily Jones, Executive Director Mike Shannon, Artistic Director Lenny Bart and Resident Music Director Henry McNulty. Climb to the highest vantage you can find and stand there, arms akimbo, looking out across Spokane's theater scene. What do you see? At first, probably nothing out of the ordinary. Some of the faces you saw at one venue last season are now congregating at another, drawn there by the natural migration of social cliques and the possibility of new opportunities. There are board meetings, a few of them tense and searching. At least one theater has had some noticeable interior work done. And then there are the eternal constants: Actors rehearsing their lines as they prepare for season openers alongside a crew of designers and costumers. Marketing teams looking for the right angle to resonate with new audiences. Fundraisers scrambling to identify untapped grants and donors. Far less conspicuous is the vacant brick building at 174 S. Howard, its windows dark and overlaid with "For Sale" signs. Until December of last year, it housed the Modern Theater. Before that it was called Interplayers, a name still visible in thin, fading lower-case letters on the building's north side. Changes in logos and leadership aside, for decades the venue had provided Spokane with its primary (or even sole) year-round professional theater. And though the extent of its professionalism could be a subject of debate and wry jokes among local actors, the theater's inability to somehow muddle through yet another setback, as it had done many times before, was a moment of reckoning. Furthermore, the impact of its closure was doubled. Along with its Spokane location, the Modern operated a sister site in Coeur d'Alene, formerly Lake City Playhouse. "The Modern closing was a hit for all of us," says Emily Jones, who performed at both Modern theaters, first in Lucky Me and shortly thereafter in God of Carnage, two years ago. "Every time a theater can't keep producing, it takes a toll on the local community." Jones is now the marketing coordinator at Spokane Civic Theatre, where she joins folks like executive director Mike Shannon, music director Henry McNulty and artistic director Lenny Bart on the community theater's paid staff. All four are relatively recent hires to replace outgoing members, the most salient being Keith Dixon, who abruptly resigned from the Civic in the middle of last season after having been hired to replace Yvonne A.K. Johnson in 2014. Johnson, for her part, appears to have kept a lower profile since returning to the area from the East Coast and launching Spokane Valley Summer Theatre last year. While at the Civic, however, she was widely regarded as a polarizing figure in the local theater community. Her tenure there wasn't without its successes, yet it also had a destabilizing effect that contributed to the outward flow of actors and support to other venues around town. These days that entropy is starting to subside and ruptures are being mended, not least because the Civic staff are using their "fresh eyes and fresh passion to reach out to the Spokane community," says Jones. "The Modern closing has given us this opportunity and this drive to really make everyone feel welcome here. It's our 71st year of providing a place to practice the art that they love." As proof of that welcome, she points to the Civic opening its doors during Hoopfest and the casting of "more brand-new volunteer actors than we ever have before," coupled with the return of actors like Daniel McKeever, once a regular cast member in Modern productions but now performing again at the theater — most recently in Kiss Me, Kate — where he got his start as a teenager. Tia Wooley, another Civic alum, is now managing director at Spokane Stage Left, the tiny upstart theater founded and funded by Bob Nelson in 2013. The post-Modern experience there has been similar; Wooley says that Stage Left has had an "opportunity to pull from that larger pool [of local actors]" and put forward stronger shows, now that they're no longer vying for the same talent. Having gained a reputation for staging fringe and unabashedly political plays such as Marx in Soho, Haymarket Eight and Wittenberg, of late Stage Left has been working to polish some of its rougher edges under Wooley's guidance. Passersby can now identify the venue by an actual sign, the website has been revamped, and the ground-level concrete floor that served as the stage for the past four seasons now sits beneath a more traditional elevated platform. In the next phases of her "five-year plan" for Stage Left, Wooley hopes to build a rear patio for outdoor seating that would make use of the set stage rather than avoid it, revamp the sound booth and lighting equipment, and refurbish the basement dressing rooms and the green room. "We want to make it more of a boutique theater. We're not ever going to be in competition with the Civic, but we can cater to our audience," she says. The improvements, both recent and anticipated, aren't without their costs, and Stage Left has responded in part by doubling its ticket prices to $20. Wooley maintains that they're "still the lowest in the area" and says the decision wasn't made lightly. She enumerates the ongoing costs — royalties, upkeep, utilities, meager stipends to cover mileage and set materials — in the theater's shoestring budget, which eat up a substantial amount of the ticket revenue from the small 70-seat auditorium. Across the nation, meanwhile, supplemental grant money is becoming scarcer, especially for arts organizations without a long track record. Ignite! Community Theatre, by contrast, is a rare example of a small-scale local theater group that hadn't been fretting over its finances, thanks to its annual Riverfront Fright haunted house fundraiser. Neesha Schrom Crosen, the current Ignite! board president, recalls a time when the organization would have "$15,000 or $20,000 in the bank" and could afford to rent seasonal space in the grand Masonic Center downtown. But then the fundraiser lost its home, the savings dwindled and Ignite! found itself in "survivalist mode." Then a stroke of luck: Just before the start of the 2016-17 season, at a point when Ignite! was having its most fraught and existential conversations, KZZU morning radio personality Molly Allen brought her original play On Shaky Ground to the theater in the hopes of arranging a premiere. "Molly's show was a huge boon to us," says Crosen, adding that initially, the theater almost didn't know how to react to her offer. Ultimately, On Shaky Ground's popular two-week run gave Ignite! enough of a financial cushion to begin looking further down the road and engaging in the kind of housekeeping necessary to become "solvent and sustainable" in the long term. The premiere had its perks for Allen as well. This season she's been named playwright in residence at Stage Left, and will be showcasing new and previous work there in October. Whatever their differences in audience and attitude, the common refrain among these and other Spokane theater groups is a desire to put the tumultuousness of the past few years behind them and find strength in unity. "We want to be team players. We're really passionate about that," Jones says of the Civic, which has already provided costumes for Stage Left's season opener, Cyrano, in exchange for promotion in the theater's playbill. Crosen says Ignite! is eager to see a "better collaboration landscape," too, not only through shared resources like props and costumes, but also through original productions like On Shaky Ground — with the ultimate goal of a scene that's robust enough to sustain a professional theater and retain the homegrown talent that the volunteer organizations work so hard to cultivate. SFCC: Ashley DeMoville was just hired to head the college's drama department as it enters its 50th year. Blue Door Theatre: Frank Tano is back as the artistic director, the troupe has swelled with new members, and the local improv scene is strong enough to sustain an increasing number of indie groups to which the Blue Door is offering stage time. Lake City Playhouse: After regrouping under its original name when the Modern closed, Lake City Playhouse has slowly recovered its footing as a community theater over the past year. It has a full, eight-show season for 2017-18. Gonzaga University: GU's new Myrtle Woldson Performing Arts Center is scheduled to be completed by December 2018. The interdisciplinary, 750-seat theater will have a full fly space and an additional 150-seat recital area and dance studio — ideal for further ZagLab collaborations with Terrain and other area arts groups.